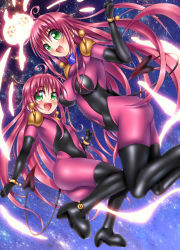 She's Lala_Satalin_Deviluke's all-costume robot, who acts as a module to form her clothing. Peke is exceptionally devoted to her creator, Lala, and is her most constant companion. She is almost always seen on Lala's head, as a hair pin and acts as her portable wardrobe.